A gravel road in Terre Haute, Indiana. 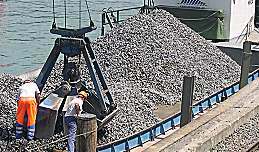 Gravel being unloaded from a barge. Gravel is rock that is of a certain particle size range. In geology, gravel is any loose rock that is larger than two millimeters (mm) (about 1/12 an inch) in its longest dimension but no more than 63 millimeters (about 2.5 inches). The natural erosion of larger rocks has led to the formation of many gravel deposits. In addition, gravel is now produced by crushing rocks mechanically. 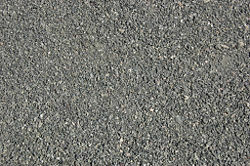 Gravel is an important commercial product, used in various applications. Many roadways are surfaced with gravel, especially in rural areas where there is little traffic. It may also be used as an aggregate in concrete. Globally, far more roads are surfaced with gravel than with concrete or tarmac. Russia alone has over 400,000 km of gravel-surfaced roads. Gravel is also used for aesthetic purposes, to enhance the appearance of gardens. 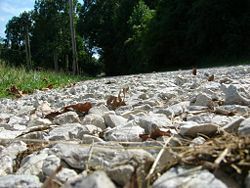 The word "gravel" comes from the French gravelle, meaning "coarse sand." As noted above, the term gravel is applied to rocks that range in size between 2 and 63 mm. Sometimes, however, the term is restricted to rock in the 2-4 millimeter range, with pebble being reserved for rock between 4-63 millimeters. The next smaller size class in geology is sand, which is more than 0.063 mm to 2 mm in size. The next larger size is cobble, which is between 63 and 256 millimeters (about 2.5 to ten inches). One cubic foot (28.32 dm3) of gravel typically weighs about 100 pounds (45 kg). As of 2007, the United States is the world's leading producer and consumer of gravel. Gravel with stones sized roughly between 5 and 15 millimeter. Multiple types of gravel have been recognized, as listed below. 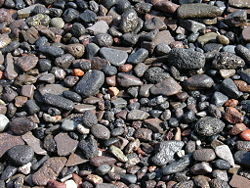 Bank gravel: This is gravel intermixed with sand or clay. Bench gravel: A bed of gravel located on the side of a valley above the present stream bottom, indicating the former location of the stream bed when it was at a higher level. Creek rock: This is generally rounded, semi-polished stones, potentially of a wide range of types, that are dredged or scooped from river beds and creek beds. It is also often used as concrete aggregate and less often as a paving surface. Crushed Rock: Rock that is mechanically broken into small pieces then sorted by filtering through mesh of different sizes. Crushed stone: This is generally limestone or dolomite that has been crushed and graded by screens to certain size classes. It is widely used in concrete and as a surfacing for roads and driveways, sometimes with tar applied over it. Crushed stone may also be made from granite and other rocks. A special type of limestone crushed stone is dense grade aggregate, or DGA, also known as crusher run. This is a mixed grade of mostly small crushed stone in a matrix of crushed limestone powder. Fine gravel: Gravel consisting of particles with a diameter of one to two mm. Lag gravel: A surface accumulation of coarse gravel produced by the removal of finer particles. Pay gravel: Also known as "pay dirt"; a nickname for gravel with a high concentration of gold and other precious metals. The metals are recovered through gold panning. Pea Gravel: Gravel that consists of small, rounded stones used in concrete surfaces. Also used for walkways or driveways. Piedmont gravel: A coarse gravel carried down from high places by mountain streams and deposited on relatively flat ground, where the water runs more slowly. 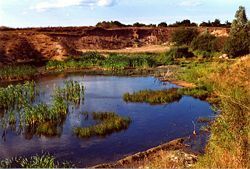 Plateau gravel: A layer of gravel on a plateau or other region above the height at which stream-terrace gravel is usually found. River run gravel: Naturally deposited gravel found in and next to rivers and streams. ↑ Mineral Commodity Summaries 2006 U.S. Department of the Interior, U.S. Geological Survey. Retrieved December 6, 2012. ↑ Industrial Sand And Gravel (Silica): World Production, By Country index mundi. Retrieved December 6, 2012. This page was last modified on 6 December 2012, at 17:39.